A well-matched car and caravan which has been sensibly loaded will be inherently stable on the road, but the addition of a stabiliser can offer extra damping when the outfit is buffeted by crosswinds or overtaking vehicles. Under most road conditions a well-matched vehicle and trailer will encounter few stability problems, even though the trailer is free to swing on its connecting ball. Detailed research has also been conducted since 1994 by the University of Bath, sponsored by the Caravan and Motorhome Club, which has fully validated the our advice that a properly matched and maintained outfit will not normally encounter stability problems. Nevertheless, some caravan and car designs are inherently more stable than others and some form of extra assistance from an add-on stabiliser device may give an easier or more comfortable tow, particularly when an overtaking vehicle's 'bow wave' upsets the outfit. There are two main categories of trailer stabiliser: those which act both horizontally and vertically and stabilisers with lateral action only. It is the latter that are increasingly fitted as standard to most touring caravanners – usually as part of a chassis package manufactured by Al-Ko or BPW. Their major virtues are their simplicity in operation with instant hitching up and the use of dry towballs. Once the head has engaged on the ball there are just two actions of the clamping lever. Because the clamps grip the side of the ball, damping is mainly on yaw and roll. Most modern hitchhead stabilisers require a dry towball and use a friction material similar to that used in brake linings. Correctly set, the friction pads on all these stabilisers should have a long service life; in the case of the Al-Ko models, a lifespan of 50,000 km (31,069 miles) is claimed. Replacement pads are available if you manage to wear them out. All Al-Ko and BPW (Winterhoff) stabilisers have a mechanical indicator built in to show when the hitch is safely engaged over the ball and the SSK3 is similarly fitted. 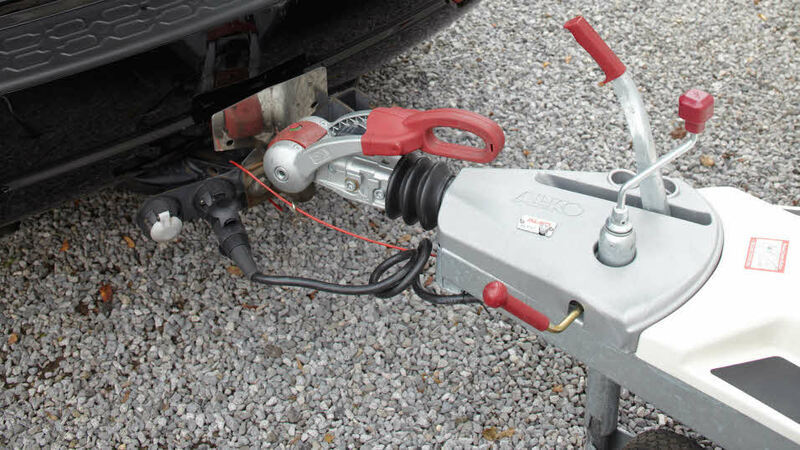 Al-Ko’s ATC is an anti-snake system designed to ‘stretch’ the caravan outfit by lightly applying the caravan brakes whenever the trailer starts to sway (yaw) beyond certain limits. Some caravan movement is natural, but if the car/caravan weight ratio is okay, the caravan loaded properly and the outfit is being driven properly, any yawing should soon damp itself out. ATC constantly monitors the caravan swing and, if it detects that sideways movements are increasing rather than decreasing, it pulls the trailer brakes on briefly bringing the caravan back into line. It will not react to sudden movements that self-correct or in normal cornering. ATC has a black box that bolts onto the axle and connects to the brake actuation rod. The most complicated part of the installation is getting a 12V supply to the unit via the 12S seven-pin plug (or 13-pin plug if fitted). Every time you hitch up the system will carry out a ‘self-check’ to ensure there is a constant live connection, this is indicated via an LED readout on the caravan drawbar (changes from red to green). Bailey, Coachman, Lunar and Swift have started fitting the ATC as standard to some of their models; however, the system can be retrofitted quite easily. Stabilisers which have lateral and vertical action have linkages connecting vehicle to trailer either on one side of the drawbar only or on both sides. Many of the stabilisers in this group operate on the same principle of a single leaf spring mounted on a friction pad: an example is the Bulldog 200Q/300Q. Remember that the stabiliser is only an aid. A stabiliser will only damp out small oscillations due to wind buffeting and overtaking large vehicles. It will not compensate for poorly matched or overloaded outfits.